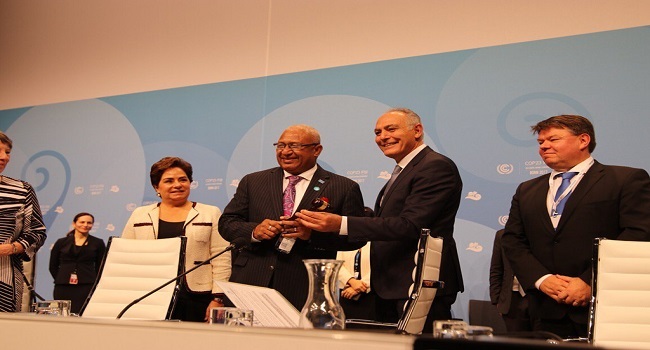 Prime Minister and COP23 President Voreqe Bainimarama has commended the German government for working with Fiji to host the global climate meeting. In a bilateral side meeting with German Minister, Barbara Anne Hendrick, Bainimarama stressed that this partnership is at the cornerstone of the grand coalition he envisioned. “In this case COP23 without a bigger sister or brother, in this case Germany came to our aid, thanks to you and we all know without your assistance, without your help, we wouldn’t be able to be here." Meanwhile COP23 Climate Champion, Inia Seruiratu, urged delegates on the urgency for consensus on climate action. Further, Faster, Together is the overarching theme that will frame the COP23 deliberations over the next twelve days.